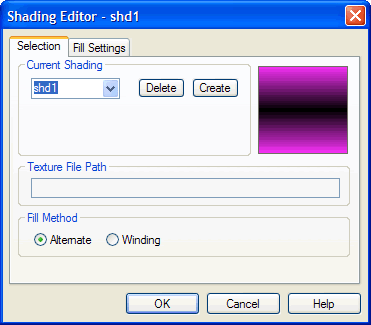 Use the Selection Tab of the Shading Editor dialog box to select a shading component for editing, create a new shading component, or set a texture file path or fill method. The Selection Tab of the Shading Editor lets you select a shading component to edit or create a new one. Thumbnail View Displays the shading component currently selected for editing. Current Shading If you have opened the Shading Editor dialog box without first selecting in the Work Window an object bearing a shading component, the name of the last available shading component (sorted alphanumerically) will appear selected. However, you may select any shading in the project from the drop-down menu. If you have first selected an object bearing a shading component and then opened the Shading Editor dialog box, its shading is displayed. Delete Click to delete the currently selected shading component from the system. Once you confirm the delete operation, all objects bearing the deleted shading component will then bear a “no shading” reference. Create Click to create a new shading component. It will appear in the Current Shading box. Texture File Path Displays the location path of a textured fill shading component’s source image. You may edit the path to specify a different source image, if desired. You can quickly choose a path to a textured fill source image by clicking the Scale, Stretch, or Tile buttons on the Fill Settings Tab of the Shading Editor dialog box. For more information, see Color Dialog Box. Fill Method Click a radio button corresponding to the way you want to apply the fill to the shading component.